Note to self: if there is the chance to drop off luggage before the room has been prepared, drop off everything except for telephone, wallet, camera and guidebook. As we waved hej-hej (that’s “bye-bye”) to Lars the landlord and strolled into town, I realized that my tablet, hardcover book and the heaps of stuff one feels one has to have while on route weighed a ton. Oh my achey-breaky shoulders. Navigating around the Old City of Copenhagen is largely a matter of orienting by spire. I lift up my eyes to the towers and occasional dome, some reflected in the mirrored surfaces of modern buildings. 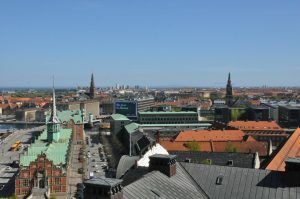 No matter where I am when I head home, I know my nest is about equidistant from Vor Helsers Kirke and Christians Kirke in Christianshavn. I triangulate with them as I walk, and I feel secure. There is a delightful new pedestrian bridge, opened only in 2016, that swoops from Christianshavn northern edge to Nyhavn across Københavns Havn. I quote from an item I found on the internet: “The 180-metre long Inderhavnsbro (Inner Harbour Bridge) connecting the Nyhavn and Christianshavn districts was opened for its first journeys, finally ending a long series of delays and setbacks.” “Scandal-plagued” it may have been but it’s a beautiful modernist arc spanning the water and those on foot are entirely safe from the bicyclists. 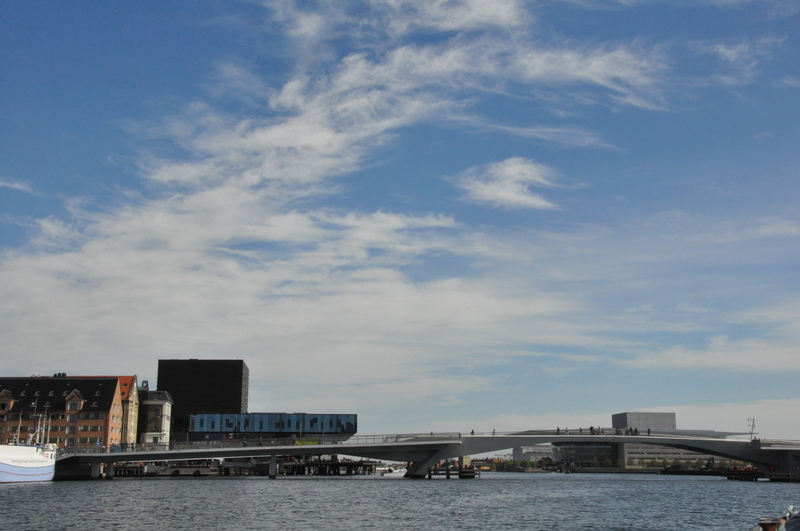 A second pedestrian bridge is slated to open this year, conjoining a row of boxy office buildings to the new Danish Architecture Center (the blue BLOX) and the Black Diamond. Not much of the new bridge was in evidence except for some preliminary construction on either bank. It’s a great idea. Hope the project is completed with much ado. The guidebooks all natter on about the café on the top floor of Magasin, the massive department store adjacent to Kongens Nytorv (King’s New Square). What they oughta bring to the tourist’s attention is the massive food court with wine and coffee bars, bakeries, butchers, delis and whatever your heart may desire on the lowest level. Shades of Galerie Lafayette in Paris! 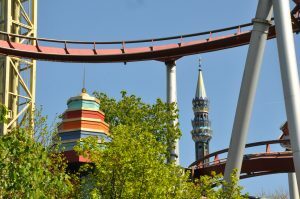 Tivoli Gardens, the oldest and original pleasure garden, is not a tourist trap but it is very confusing to navigate. There are two entrances and no indication which would be better (I recommend the one on Vesterbrogade. A map comes with the ticket but the “map” is really an imaginative rendering of the approximate locations of prominent features, like the lake and some of the rides. It took several tries to find the hot dog stand as we moved through real space. Music stages throughout the park showcased the talents of youngsters from the Tivoli music school. We also discovered hyldeblomst sorbet: elderflower-fragrant, slightly lemony, slightly sweet, incredible. 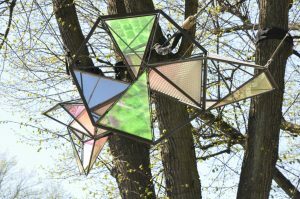 Those geometric, iridescent forms hanging from tree branches? That’s an artwork, Little Sun Light Swarm, by Olafur Eliasson, one of my favorite contemporary sculptors. 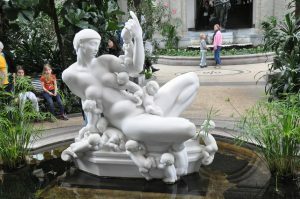 I’m not even sure what to say about the blindingly white marble “Water Mother” (1921) by Kai Nielsen that marks the main entrance to the Winter Garden in the Ny Carlsberg Glyptotek. I already miss spandauer, kanelstanger and smørrebrød. Copenhagen museums take immense pride in the quality of their cafés and their staff are just so darned cheery. 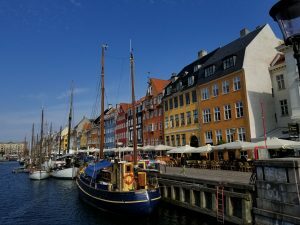 Our lunches at the Ny Carlsberg Glyptotek and Statens Museum for Kunst (National Museum of Art) were about the best meals we had. The specialist in manuscripts, Christopher de Hamel says Søren K at the Black Diamond is excellent, too. 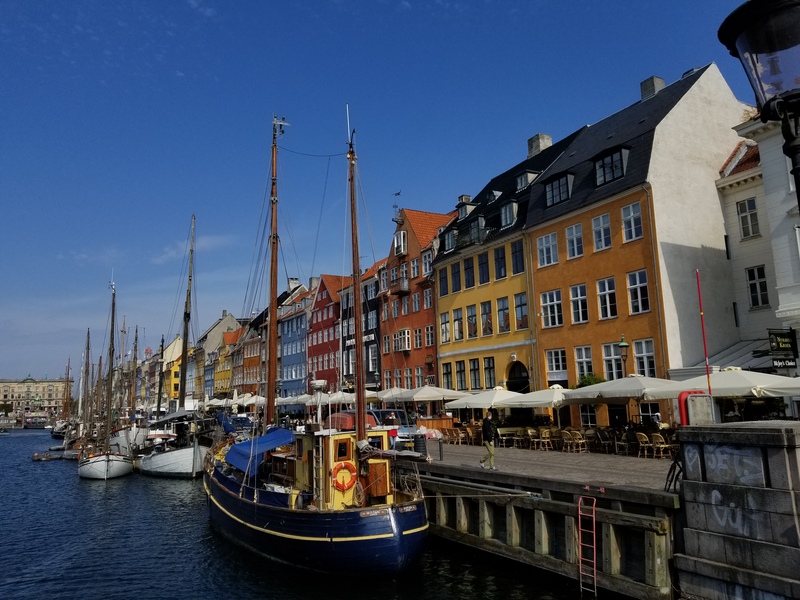 Nyhavn is a likely a mess on any weekend and any sunny day. On Monday, with a nip in the breeze and unreliable sunshine, it was endearing, colorful and nautical much in the way that Honfleur, France is. 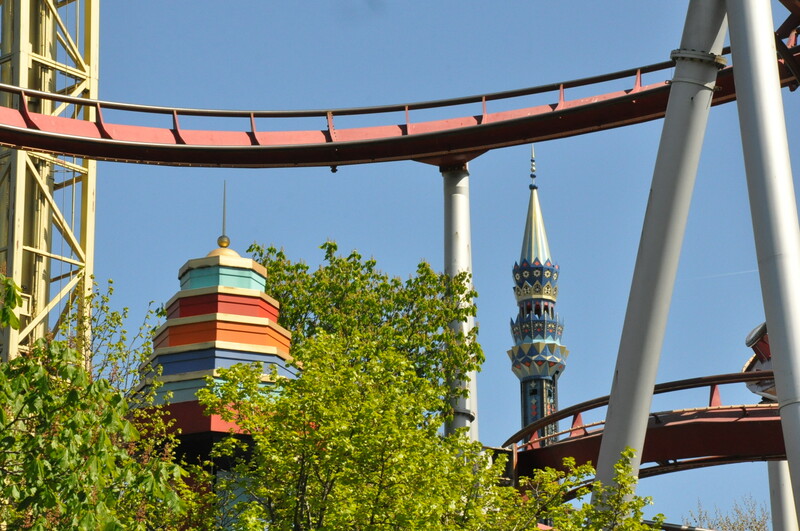 On a bright Saturday in May? An utter mob scene. The only things I every learned about Copenhagen had to do with Vikings, until I studied art history and discovered that Emil Nolde, a painter associated with the German Expressionist group, die Brücke, was actually Danish, although I was not clear about what that meant. 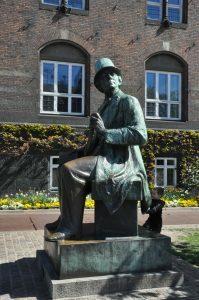 Then I read the magisterial biography of Hans Christian Andersen by Paul Binding (Yale University Press, 2014) and discovered the First and Second Schleswig Wars (1848-1852 and February-October 1864) at which point Schleswig, Holstein and Saxe-Lauenburg were ceded to Prussia and Austria. Nolde was born in 1867 so while he was technically Prussian, his folks originally were Danish. Now I know.